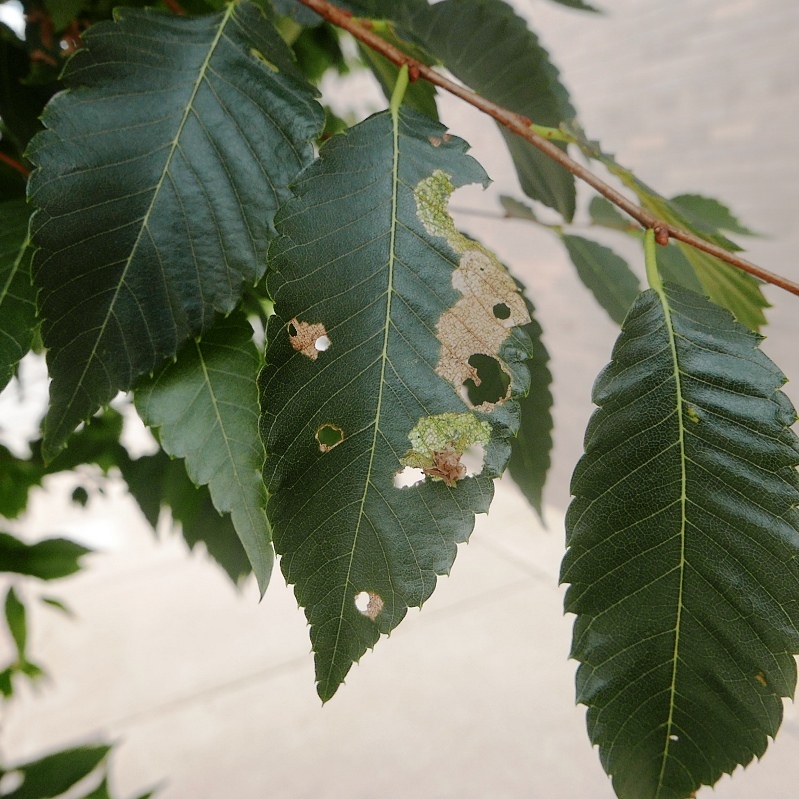 As the BoggMan writeth, early bagworm damage is oft overlooked, with skeletonization injury passed off as Japanese beetle injury or other chewing insect damage. This was driven home to me last week as I checked out some elm street trees in Orrville. Until I looked closely following Joe’s BYGL Inservice discussion and subsequent alerts, I am sure I would have missed the early dunce-cap stage of the common bagworm (Thyridopteryx ephemeraeformis). There they were though, munching away, building their bags, and causing small sections of the leaf to fall out. The tell-tale dunce-cap stage of the bagworms was tailor-made for…moi. Another little twist of this tale, however, came the next day, while checking out white pines with Kim Kellogg of Grasshopper, Inc. in Berlin in Holmes County. I stopped short as I passed the pine and said: “hey, Kim, look at this – it is grass bagworm (Psyche casta), a feeder on grasses, lichens and other organisms, often noted on landscape plants when the “bags” turn brown this time of year. Kim and I looked closely then and realized these were not grass bagworms, but, once again, just the smaller stages of the common bagworm. We then found dozens more on these white pines. If this is a maintained landscape, this pest can become very damaging: just ask arborvitaes and junipers and many other woody plant hosts. Oh, wait those arborvitaes cannot talk. Especially, if they are dead. So, pick off, or treat earlier (it is late for insecticides now). But what does a grass bagworm really look like? Well, last Thursday, while preparing for one of Kathy Smith’s Tree ID workshops at OSU-Mansfield, voila – grass bagworm.